Springfield held a Pre-K through Grade 3 conference on November 4 as part of its Birth through Grade Three Alignment Partnership work. The conference brought together senior district leaders, principals, preschool directors and teachers, and representatives from community organizations. The centerpiece of the day was a presentation by Kristie Kauerz, a national leader in the P-3/Birth -Third movement. Kristie was formerly the director of Harvard’s Pre-K-3rd initiative and is currently a research scientist at the University of Washington in Seattle, where she is starting a national P-3 Center. Kristie’s presentation and the discussion it provoked provide a compelling summary of the research that underlies the Birth through Grade Three movement, an introduction to an important Birth-Third framework, and useful advice and tips based on the experience of communities around the country. Below I share a few highlights. Kauerz discussed a number of findings from the research on brain development that show the importance of supporting learning and development in children’s first five years. Kauerz shared pictures that illustrate the extraordinarily rapid development of neural connections in the first six years, some of which then atrophy by year 14. According to Kauerz, “What stays are the connections that are reinforced. If we are reinforcing the good things, they stick around.” She emphasized the integrated nature of cognitive, social, and emotional development, saying you can’t tease them apart or do one without the other. 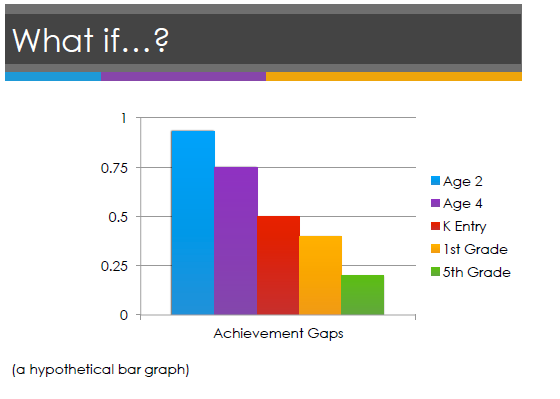 While reading proficiency by grade three is an important goal of P-3 efforts, it is one goal of several inter-connected ones, including not only social, emotional, and physical development, but also early mathematical learning. Kauerz notes that preschool math skills have been shown to be an even better predictor of later learning than early literacy skills. The upshot of the research on brain development: the ability to change brain development and behavior decreases over the lifespan, but happily never bottoms out. We can all keep learning. It is, however, easier, and cheaper for that matter, to influence brain development and behaviors in the early years. “This is our window of opportunity,” says Kauerz. For helpful visuals on the science of brain development, see Five Numbers to Remember About Early Child Development and Core Concepts in the Science of Early Childhood Development. The Center for the Advanced Study of Teaching and Learning at the University of Virginia used the CLASS classroom observation tool to assess quality across the prekindergarten through third grade span in classrooms across the United States. Kauerz emphasized that the study found emotional support to be reasonably good across the spectrum, including in K-3 classrooms, contrary to what some think about early elementary classrooms. Classroom organization was scored slightly lower than emotional support. The big problem, however, was in instructional support, which hovers around 2 on a scale of 7. “This is what we need to be worried about,” says Kauerz. Two-thirds of the students in the study experienced inconsistent instructional support as they progressed from first to third to fifth grade, and one-fifth of students experienced consistently low quality instructional support across these grades. The P-3 Approach: What If? Kauerz sees the P-3 approach as a means to address the need to improve learning and development in the first 9 years of life, thereby improving learning for all and reducing gaps. 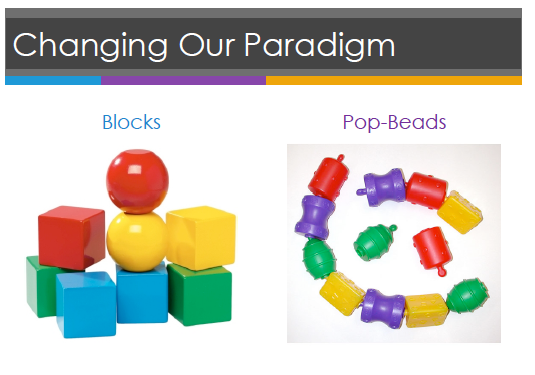 She uses a metaphor to explain her vision of what an aligned P-3 system would look like, comparing toy building blocks to pop beads. Source: Kauerz, K. (4 Nov 2013). 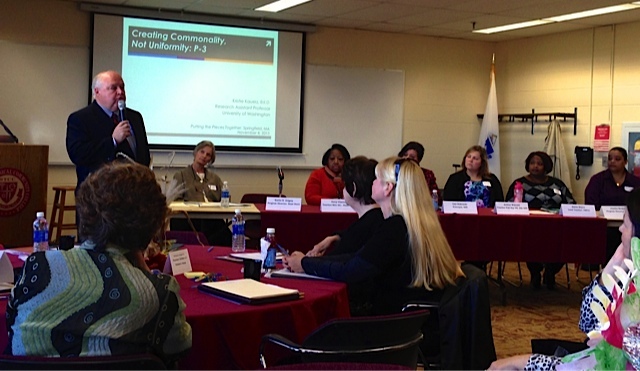 Presentation to Springfield’s Leadership Conference. Instead of each silo as a separate building block, pop beads suggest separate pieces, each of which needs independent work but that are connected to each other, yielding a connected, flexible continuum when attached. Establishing patterns of student engagement in school and learning. Source: Kauerz, K. (4 Nov 2013). Kauerz emphasizes that people should not follow the framework like a recipe and instead advises that communities “choose 3-5 things to do really well.” Communities that have successfully done this work had a “laser-like focus” on a small set of goals. Priority. Moving beyond superficial implementation requires that leaders make difficult choices about how they are spending money and the initiatives underway in their districts. These choices may require shifting funds from less impactful initiatives and strategically reviewing the accumulation of initiatives to determine what to continue and what to stop. Ownership. Kauerz cites instances in which groups have convened to meet and talk about P-3, sometimes on an ongoing basis, but the real work isn’t taking hold. It is critical to build ownership and buy-in among stakeholders, including teachers, if P-3 work is going to have an impact. She cites this example from Chicago in which a partnership started over when it realized it wasn’t making progress. Progress-monitoring. Communities cannot wait until “the end” of their initiative to see if they are having an impact. 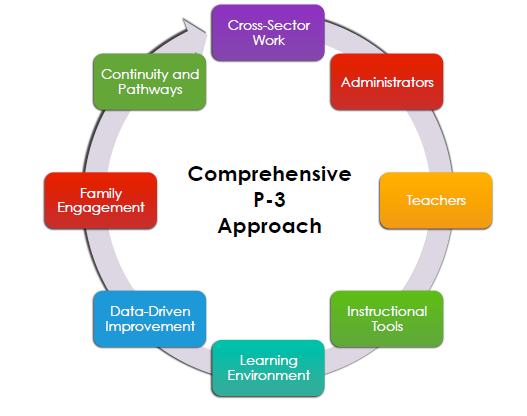 Implementing P-3 requires an extended period of time, but it is critical to monitor progress in an ongoing fashion so that leaders can address problems and make adjustments to ensure that work is leading to improved outcomes for children. State Agency Alignment and Misalignment. An audience member noted instances in which districts get conflicting messages from state agencies, whose policies and guidelines are not always aligned. Kauerz mentioned the need for “barrier-busting meetings” in these cases, highlighting the need for multiple state agencies to work collaboratively with districts to address alignment issues. 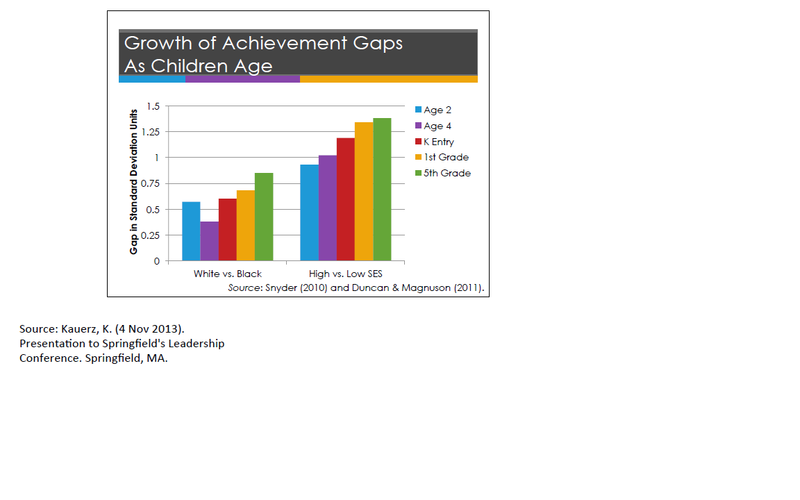 Leading for Equity: The Pursuit of Excellence in the Montgomery County Public Schools. Improbable Scholars: The Rebirth of a Great American School System and a Strategy for America’s Schools. A note on terminology: Different terms are used to describe the movement to improve and align education and care from before birth through third grade. Kauerz uses “P-3” to refer to everything before (i.e., “pre-“) school through third grade. Others, including the MA EEC and this blog, use the term Birth through Grade Three (Birth-Third).